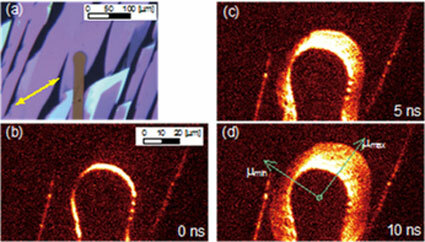 (Nanowerk News) Organic single crystal semiconductors have uniform crystal structures throughout their bulk. This means that any charge-carrying particles within the crystal will encounter different obstacles depending on their direction of travel (as an analogy, a stack of boxes looks different from different angles!). This property, known as mobility anisotropy, is very important to consider when using single crystals in the development of electronic devices. The most simple and direct method to measure charge carrier mobility, and therefore assess the level of mobility anisotropy within a crystal, is the current-voltage (IV) measurement. However, this requires large crystals, and cannot provide very high resolution for assessing the angular dependence. Now, Takaaki Manaka and Mitsumasa Iwamoto at Tokyo Institute of Technology have successfully visualized anisotropic carrier motion by using time-resolved microscopic optical second-harmonic generation (TRM-SHG) imaging (Applied Physics Express, "Direct Observation of Anisotropic Carrier Transport in Organic Semiconductor by Time-Resolved Microscopic Second-Harmonic Imaging"). (a) Polarized microscopy image of round-shaped gold electrode. Time evolution of TRM-SHG images from round-shaped electrode at delay times of (b) 0, (c) 5, and (d) 10 ns. The light source for the TRM-SHG measurement was a femtosecond optical parametric amplifier. The round-shaped electrode that was deposited on the TIPS pentacene single crystalline domain was used to visualize the angular dependence of the carrier velocity at once. The elliptic shape of the SHG distribution directly represents the anisotropic carrier transport properties of the film, and the mobility anisotropy of this sample was evaluated as being 4.5. The TRM-SHG measurement is an effective method to investigate the anisotropic nature of carrier transport in practical devices.